Many of the ornamental grasses have been looking good for some time now especially since most of them have lost their green colour and become faded shades of beige and soft golden bronze. They have been providing structure and interest when many other herbaceous plants have collapsed, and on the mornings that the frost has settled on them they’ve looked positively magical. One of the most useful and popular is the Feather Reed Grass - Calamagrostis x acutiflora ‘Karl Foerster’ which has straight and erect stems and leaves topped by small, feathery flowers that move in the slightest breeze. It adds an excellent vertical accent to the garden and looks lovely planted in a traditional herbaceous border with other plants or in meadow or naturalistic style plantings but is also perfect used in contemporary modernist planting in containers. It is fast-growing and reliable (enduring almost everything that winter can throw at it) making dense clumps that only require a cut back in early spring before the new growth starts. The plant itself was named in honour of the great German nurseryman Karl Foerster who started his nursery in the early 1900’s and was the first person to use grasses in mixed borders. He championed a more natural style of gardening, which he called “wilderness garden art”. This developed very differently from the English Country Garden style popularised at that time by gardeners such as Gertrude Jekyll with her colour co-ordinated and labour-intensive perennial plantings and by Foerster’s contemporary Vita Sackville-West at her famous garden in Sissinghurst. Foerster advocated a move towards greater ecological stability with natural plant associations, and for using plants as design tools rather than for individual characteristics. As such he is considered by many to be the grandfather of the New Perennial Movement. Foerster was a pioneer in breeding perennials at his nursery in Potsdam in Eastern Germany, and many of the plants he introduced, such as varieties of larkspur and delphiniums, helenium, phlox, asters and grasses, are among the most popular perennials found in gardening. He bred over 350 plants, only continuing with those which performed well under adverse conditions - they had to be fully hardy, drought and disease resistant, heat tolerant and reliably perennial. 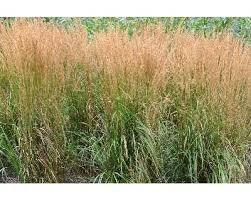 The Feather Reed Grass is a perfect example of these attributes and deserves a place in every garden.